Pipette.com Promotions For NEST Cell Tissue Culture Dish Products: Flasks, Dishes & Plates! Growing cells under controlled conditions require a keen eye for detail and an investment in these products that can help maintain their viability. Using cheap products can lead to the contamination of your cell tissue culture and ultimately compromise the results of your experiment. At Pipette.com, we are currently offering numerous promotions on our NEST cell tissue culture dishes, plates and flasks to give you the tools that you need to sustain your cell cultures. 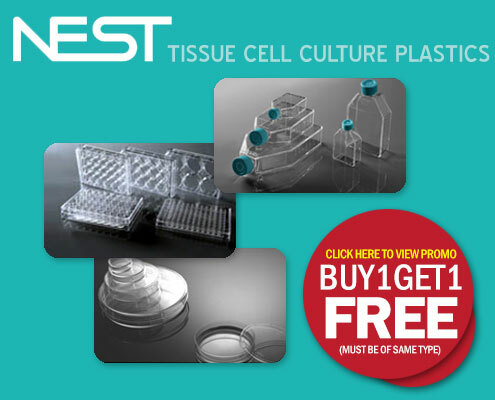 We are currently offering buy one get one free promotions on all of our NEST cell tissue culture dishes, plates, and flasks. This means you can select two plate, dish, or flask part numbers and use the promotional codes below at checkout to reduce the price of one of your items to zero. With easy access to your cells and the flexibility to be used for all types of culturing, our NEST dishes will ensure that your cells are always in top shape. Made from high clarity polystyrene in an ISO 13485 facility and treated with vacuum gas plasma for uniform and consistent cell attachment, our tissue cell culture dishes are the best on the market. Our NEST cell culture plates use unique solutions to outperform competing brands including low profile, low-evaporation lid design to ensure uniform growth and round edges for improved handling. With specifications that match the ISO 13485 level of quality and a price that is guaranteed to be 15% to 30% less than your current supplier, our NEST plates are designed for success in the lab. Sustaining a cell tissue culture properly requires protection and our NEST cell culture flasks offer the highest level around for long-term cultivation and cell expansion projects. With design catered to improving workflow and maximizing breathability, you can rest assured that your cultures are in a safe, sterilized flask. Our NEST cell tissue cultures dishes, plates and flasks at Pipette.com possess high quality design to ensure that your cell culture projects end in success. For a complete look at all of our NEST products, take a look at our cell culture products page today! https://solutions.pipette.com/wp-content/uploads/pipettecom-logo.png 0 0 Scott https://solutions.pipette.com/wp-content/uploads/pipettecom-logo.png Scott2015-06-12 11:56:512015-09-16 09:34:39Pipette.com Promotions For NEST Cell Tissue Culture Dish Products: Flasks, Dishes & Plates!